Bhí Tadhg Ó Máille, Seán Aindí Ó Ceallaigh agus Evan Ó Flatharta ar fhoireann Faoi 21 na Gaillimhe a d'imir i gComórtas Peter McNulty. Chríochnaigh siad cothrom leis an Clár sa gcéad cluiche 1-11 an taobh, ach theip orthu i gcoinne Cill Dara 1-20 le 0-9 agus fuair Laois an ceann is fearr orthu sa gcluiche deireadh, 1-17 le 2-9. Bhí Sarah Ní Loingsigh ar phainéal Ban na Gaillimhe a d'imir sa tSraith Náisiúnta Peile Roinn 1. Ar an Domhnach, 7 Feabhra, fuair siad an ceann is fearr ar Mhuineacháin i dTuaim, 3-13 le 2-9. An tseachtain dár gcionn theip orthu le pointe amháin i gcoinne Mhaigh Eo, arís i dTuaim, 1-10 le 2-8. 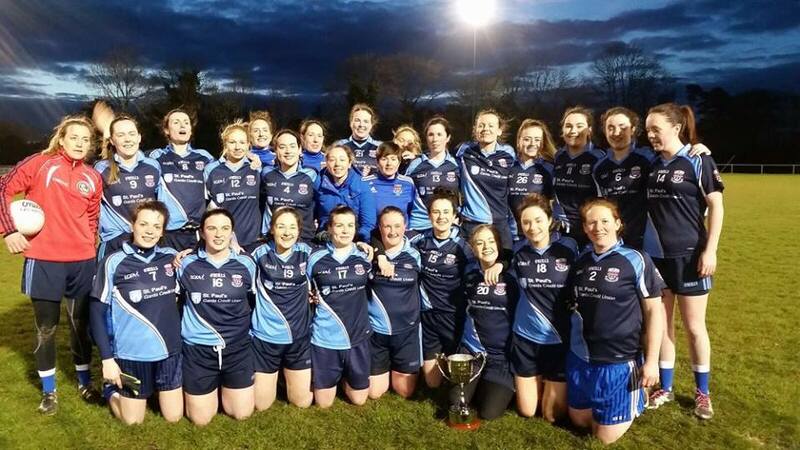 Thosaigh Sarah ar an líne leathchúl ar chlé nuair a fuair siad a dara bua sa tsraith le bua cuimsitheach ar Thír Eoghan, 2-20 le 1-2, thuas i nGarbhachadh i dTír Eoghan ar an 21 Feabhra. Thosaigh Sarah ar an líne leathchúl ar chlé arís an tseachtain dar gcionn ach ní raibh deireadh mhaith le mí Feabhra acu nuair a fuair Ciarraí an ceann is fearr orthu thíos sa bhFionnúig ar an 28 Feabhra, 2-8 le 2-15. Bhí Sarah Ní Loingsigh agus mná na Gaillimhe i bPáirc na nGael, Ard Mhaca ar an Domhnach, 6 Márta, ag fáil an ceann is fearr ar an fhoireann baile sa tSraith Náisiúnta Peile Roinn 1, 1-19 le 3-7. Bhí Tadhg Ó Máille sa gcúl d'fhoireann Faoi 21 na Gaillimhe a theip orthu i gcoinne Ros Comáin, 2-10 le 1-16, i gCraobh Chonnacht ar an Aoine, 11 Márta i gCill Tuama, Ros Comáin. Tháinig Seán Aindí Ó Ceallaigh isteach mar fhear ionad sa dara leath. Bhí Ciarán Ó Fátharta ina roghnóir. Bhí Ríona Ní Fhlatharta ar an líne leathtosach ar chlé ar fhoireann Mionúir Cailíní na Gaillimhe a fuair an ceann is fearr ar Liatroim i gCraobh Chonnacht, 13-19 le 1-3 agus ar Mhaigh Eo le aon phointe amháin, 4-13 le 5-10, i gCraobh Chonnacht ar an Satharn, 19 Márta i mBealach an Doirín, Maigh Eo. Bhí Rosanna Ní Bháille sa gcúl d'fhoireann Faoi 14 Cailíní na Gaillimhe a theip orthu sa gcluiche ceannais i gcoinne Mhaigh Eo i gcomórtas Blitz Chonnachta i gClár Chlainne Mhuiris ar an Domhnach, 20 Márta. Scóráil Ríona Ní Fhlatharta pointe d'fhoireann Mionúir Cailíní na Gaillimhe a chríochnaigh cothrom le Ros Comáin, 4-13 le 5-10, i gCraobh Chonnacht ar Luan Cásca, 28 Márta i gCill Bhríde, Ros Comáin. Tá áit bainte amach acu anois i gcluiche ceannais Chraobh Chonnachta i gcoinne Mhaigh Eo. 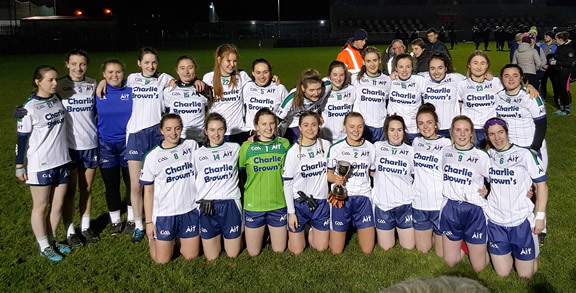 Bhí Rosanna Ní Bháille sa gcúl d'fhoireann Faoi 14 Cailíní na Gaillimhe a fuair an ceann is fearr ar Mhaigh Eo, 4-14 le 2-8, i gCraobh Chonnacht ar an Satharn, 2 Aibreán i gCathair na Mart. Fuair siad bua cuimsitheach ar Liatroim i gCluain ar an Aoine, 22 Aibreáin, 5-20 le 2-8. Bhí Sarah Ní Loingsigh ar phainéal Ban na Gaillimhe a theip orthu i gcoinne Chorcaigh, 1-11 le 6-15, sa tSraith Náisiúnta Peile ar an Domhnach, 3 Aibreán i dTuaim. Bhí Annabel Ní Chonghaile ar phainéal Faoi 16 Cailíní na Gaillimhe a fuair an ceann is fearr ar Ros Comáin i gCraobh Faoi 16 Chonnacht i mBaile Sheáin, Ros Comáin ar an Céadaoin, 13 Aibreán, 3-12 le 3-11. Lean siad é sin le bua ollmhór ar Shligeach, 8-23 le 0-2 i Scardán ar an Céadaoin, 20 Aibreán. Chríochnaigh siad cothrom le Maigh Eo i mBéal an Átha, 1-8 le 0-11, ar an Céadaoin, 27 Aibreán. Bhí Aoife Ní Mháille ar phainéal Ban Coláiste an Garda Síochána a bhuaigh Corn Uí Mhuineacháin nuair a fuair siad an ceann is fearr ar Coláiste na hOllscoile, Baile Átha Cliath ar an Déardaoi 7 Aibreán i gCill Dara, 2-14 le 1-6. Scóráil Ríona Ní Fhlatharta pointe d'fhoireann Mionúir Cailíní na Gaillimhe agus iad ag fáil an ceann is fearr ar chailíní Mhaigh Eo i gcluiche ceannais Craobh Chonnacht ar Luan, 2 Bealtaine i mBéal Átha hAmhnais, Maigh Eo. Bhí Edel DePaor ina Oifigeach Idirghabhála. Seo é an ceathrú bliain as a chéile ag Gaillimh an craobh Mionúir Cúige a thabhairt leo. Bhuaigh Rósanna Ní Mháille agus Cailíní Faoi 14 na Gaillimhe Craobh Chonnacht ar Domhnach, 8 Bealtaine i mBaile an Locha, Maigh Eo, agus iad ag fáil an ceann is fearr ar chailíní Mhaigh Eo sa gcluiche ceannais, 3-17 le 5-8. Bhí Tadhg Ó Máille ar phainéail Sóisir na Gaillimhe a fuair an ceann is fearr ar Liatroim, 1-15 le 1-7, i gcluiche leathcheannais Craobh Chonnacht ar an Céadaoin, 4 Bealtaine i dTuaim. Theip orthu sa gcluiche ceannais in aghaidh Mhaigh Eo, 0-12 le 1-11, thuas i gCora Droma Rúisc ar an Satharn, 21 Bealtaine. D'imir Antaine Ó Laoi (0-2), mac le Joe Joe Antaine, mar lán tosach. Theip ar Anabel Ní Chonghaile agus ar Cailíní Faoi 16 na Gaillimhe i gcluiche ceannais Craobh Chonnacht ar Chéadaoin, 18 Bealtaine i mBéal Átha hAmhnais, Maigh Eo, nuair an fuair an fhoireann baile an ceann is fearr orthu le aon phointe amháin agus iad ag scóráil dhá chúl ag deireadh na himeartha chun an scór deireadh a fhágáil Mhaigh Eo 4-7 Gaillimh 3-9. Theip ar Rosanna Ní Bháille agus ar Cailíní Faoi 14 na Gaillimhe i gcluiche leathcheannais na hÉireann i gcoinne Ciarraí ar an Domhnach, 12 Meitheamh, thíos ar pháirc Fíonach, Co Luimneach, 0-10 le 2-8. Fuair Maitias Eoin Bairéad agus foireann Mionúir na Gaillimhe an ceann is fearr ar Ros Comáin i gcluiche leathcheannais Chonnacht ar an Céadaoin, 29 Meitheamh, thíos i gCill Tuama, 3-11 le 1-7, chun áit a bhaint amach i gcluiche ceannais Chonnacht i gcoinne Mhaigh Eo ar an Domhnach, 10 Iúil, ar Pháirc an Phiarsaigh. Tháinig Maitias Eoin isteach mar fhear ionad sa dara leath. 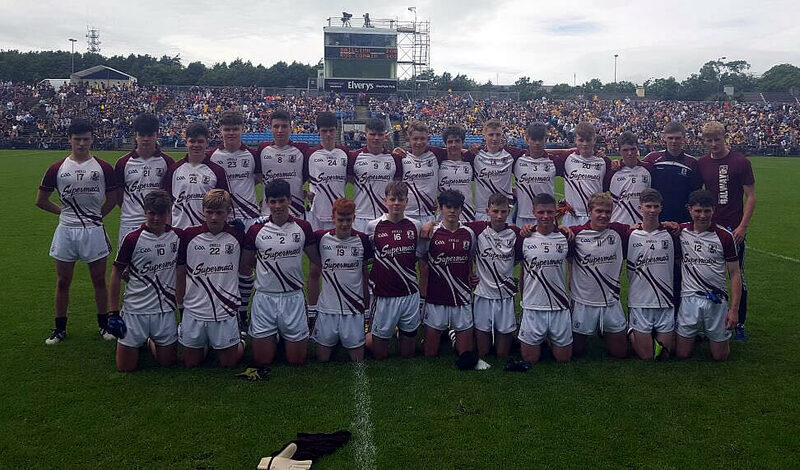 Fuair Maitias Eoin Bairéad agus foireann Mionúir na Gaillimhe an ceann is fearr ar Mhaigh Eó i gcluiche ceannais Chonnacht ar an Domhnach, 10 Iúil, istigh ar Pháirc an Phiarsaigh, 1-9 le 0-6, chun áit a bhaint amach i gcluiche ceathrúceannais na hÉireann i gcoinne Laois. Theip ar Ríona Ní Fhlatharta agus ar Cailíní Mionúi na Gaillimhe i gcluiche leathcheannais na hÉireann i gcoinne Chorcaigh ar an Satharn, 16 Iúil, thíos san Aonach, Co Thiobrad Árann, 3-12 le 3-14. D'imir Seosamh Ó Gubáin sa chúl agus bhí Oisín Mac Donnacha mar lán tosach ar fhoireann Faoi 16 Iarthair agus Cathair na Gaillimhe a fuair an ceann is fearr ar Ros Comáin, 3-8 le 3-3, i gCorn Ted Webb i gCaisleáin an Bharraigh ar an Domhnach, 17 Iúil. Scóráil Oisín 1-3. Bhí Seosamh Ó Gubáin sa chúl agus bhí Oisín Mac Donnacha mar lán tosach ar fhoireann Faoi 16 Iarthair agus Cathair na Gaillimhe a fuair an ceann is fearr ar Mhaigh Eo, 1-14 le 0-3, i gCorn Ted Webb in Ionad GLG Chonnacht ar an Aoine, 22 Iúil. Scóráil Oisín 1-4. 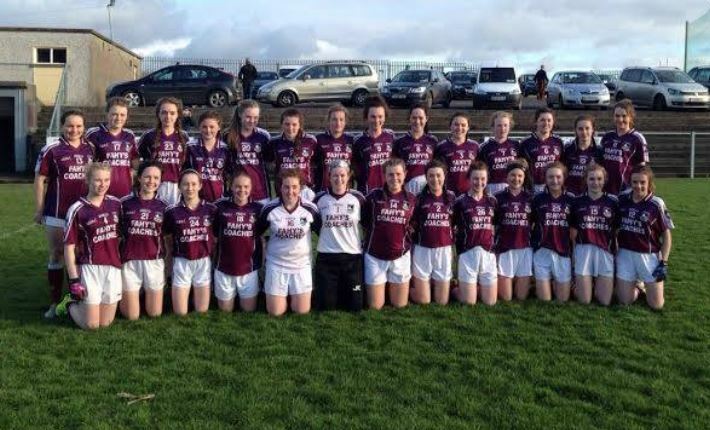 An tráthnóna céanna fuair na leads an ceann is fearr ar fhoireann Tuaisceart na Gaillimhe sa gcluiche leathcheannais, 0-14 le 1-8, scóráil Oisín 0-5 sa gcluche seo, chun áit a bhaint amach sa gcluiche ceannais i gcoinne foireann Iar-dheisceart Mhaigh Eo. Bhí Seosamh Ó Gubáin sa chúl agus bhí Oisín Mac Donnacha mar lán tosach ar fhoireann Faoi 16 Iarthair agus Cathair na Gaillimhe a theip orthu i gcoinne Iar-dheisceart Mhaigh Eo, 1-11 le 2-9, i gcluiche ceannais Corn Ted Webb in Ionad GLG Chonnacht ar an Aoine, 5 Lúnasa. Tá Seosamh Ó Gubáin (uimh 1) sa líne tosaigh agus tá Oisín Mac Donnacha (uimh 14) sa líne cúil. Buíochas le Dennis Carr (@DennisCarr0) as an pictiúir. Bhí Ríona Ní Fhlatharta sa líne leath-thosach ar dheis ar fhoireann Institiúid Teicneolaíochta Bhaile Átha Luain a fuair an ceann is fearr ar mhná Ollscoil Chathair Bhaile Átha Cliath le aon phointe amháin i gcluiche ceannais Roinn 2 i gCionn Átha Gad ag deireadh mí na Samhna. Tá Ríona Ní Fhlatharta (uimh 10) sa líne cúil, an 6ú duine isteach ó taobh na láimhe deise.